In the next two years banks will move to a wider corporate transaction banking-based API plan. London, 2 May 2017 – Forward-looking banks will start opening application programming interfaces as a competitive tool to collaborate with their corporate clients in business-to-business transactions that span all global corporate banking processes. But if banks have less money, less time, and a greater focus on security that hinders their ability to focus on and deliver what’s needed in today’s competitive market, can collaboration with fintech companies be the most effective and efficient way forward? 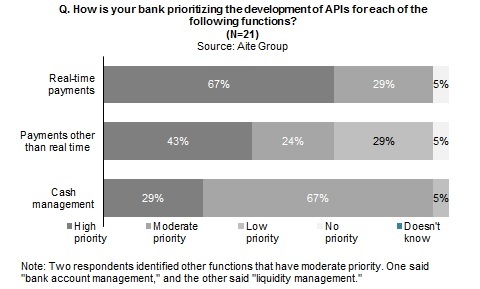 Based on Aite Group interviews with product managers, line-of-business heads, and digital channel managers at Asia-Pacific, European, and North American banks as well as with fintech providers, this report presents information on banks’ strategies for deploying APIs. It also leverages a late 2016 Aite Group email survey of and telephone interviews with 21 major international banks. This 25-page Impact Report contains five figures and one table. Clients of Aite Group’s Wholesale Banking & Payments service can download this report, the corresponding charts, and the Executive Impact Deck. This report mentions Citigroup and Standard Chartered.